I just swapped/switched my hardware (new MB, CPU, RAM) and am no longer able to boot into antergos. The SSD with antergos is still the same, so I expected a smooth transition. ERROR: resume: hibernation device ’UUID=...’ not found. ERROR: device: 'UUID=...' not found. Skipping fsck. I did not hibernate before going to bed yesterday so I don’t have a clue what this is about. Hope this state is recoverable since I have no backup. My new MB is a Asrock b450 pro 4. Could uefi be at fault here? @Wandang looks like uuids have changed so you can boot from ISO chroot into system get new uuids and put then in place, in /etc/default/grub and /etc/fstab rebuilding grub.cfg and it should boot again. @joekamprad thanks for your help. ISO chroot requires a live distri system via USB right? I will need to find a tutorial for your steps because I never worked with chroot before . You’ll then be root for the drive you’ve mounted. When done type exit and you’ll return to the Live ISO CL. When you’re in the live iso, just open Chromium and go to the Antergos wiki, open the terminal and follow the instructions for chrooting on the site. Sorry for the late reply guys. so I am wondering right now if I did not have uefi beforehand and how I can check that. (there is no mount point for efi in my gparted). As someone said, going from BIOS to UEFI would require more hackery, so I am still googling. /etc/default/grub does not have any uuid entries (only flags how the system should handle them) so I am leaving that file as it is and only change the fstab. after that i just regenerate grub via update-grub and i am good to go right? WARNING: Device /dev/loop0 not initialized in udev database even after waiting 10000000 microseconds. WARNING: Device /dev/sda2 not initialized in udev database even after waiting 10000000 microseconds. WARNING: Device /dev/sda3 not initialized in udev database even after waiting 10000000 microseconds. WARNING: Device /dev/sda5 not initialized in udev database even after waiting 10000000 microseconds. Upon closer inspection I realized that the UUIDs never changed. The old and new values were identical. You can check if there are such settings in your efi firmware? that’s a quote from @robgriff444 not me. The easiest way to find out if you are running UEFI or BIOS is to look for a folder /sys/firmware/efi. The folder will be missing if your system is using BIOS. I edited my last post where the uefi claim came from. I tried to install antergos as a dual boot the first time I tried antergos, but it was not working (you helped me back then as well). In the end I just installed antergos alone and let it format and repartition iself (auto mode). Looking back at that thread it seems like I was never able to start the uefi version of the usb boot medium so I assume it was a bios installation after all. Maybe I will just do a dirty backup (media data, etc) and reinstall this time with uefi? Or is there a better way to switch to uefi? (It does not need to be uefi though. If I can force the mainboard to accept bios that’s fine as well). Try using LABELs instead of UUIDs in files /etc/fstab and /boot/grub/grub.cfg. 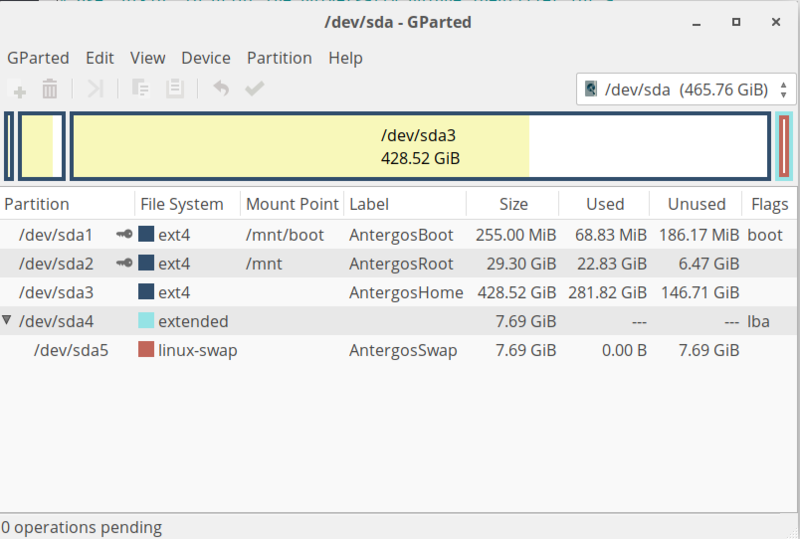 You may use gparted to create LABELs for the partitions. so basically it will look like this? The EFI label would change to BIOS in case it is not EFI? This seems to be a recent bug (december 2018). @Wandang if system boots in efi mode it will not work as you try at all… you will need to set efi-firmware to boot in legacy (BIOS) mode! @joekamprad yeah, I will check for a flag in my mainboard firmware. But even if that is possible I am still concerned about the error ridden grub config generation. Thank you guys for your amazing patience! Edit: the only thing I could find was CSM(compatibility support module) which was already enabled by default.